Donald D. Engen, 75, director of the Smithsonian's National Air and Space Museum died in a motorized glider accident while vacationing in Nevada on July 13, 1999. As the editors of Air & Space Magazine observed, "he loved soaring, and it is quite impossible to avoid the thought that he was pursuing his life's passion at the time of his death”, But he accomplished much, much more during his lifetime. Mr. Engen served 36 years in the Navy fighting in three wars. He was awarded 29 Navy decorations and awards, including the Navy's highest honor, the Navy Cross, for his actions in World War II as a bomber pilot, He retired from the Navy as a Vice Admiral in 1978. In his memoir, "Wings and Warriors: My Life as a Naval Aviator, " he shared his most intimate thoughts about both successes and failures. He learned from both. His civilian-public service career took off in 1982 when President Ronald Reagan appointed him to the National Transportation Safety Board. 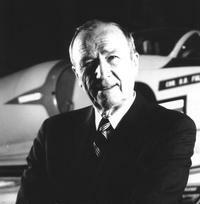 Two years later, he was named administrator of the Federal Aviation Administration, where he served until 1987. As director of the National Air & Space Museum, Engen became the driving force behind the development of the museum's annex at Dulles International Airport, now scheduled to open in 2003. Shortly before his death, he met with leaders of the rotorcraft industry to promote the filming of a new IMAX movie on the world of helicopters and vertical flight.